Wondering which synthetic chemicals to avoid in your cosmetics and personal care products? It’s a little tricky to figure out. This info-graphic was created to illustrate a point often reinforced by the scientific community; that everything at its core is a chemical, which is true. I take issue, though, when this fact is used to promote the notion that manmade chemicals as safe as natural ones… in small doses. As though a human being could get cancer from eating (formaldehyde-containing) pears just as easily as they could from using, on average, 9 formaldehyde-releasing personal care products every day for most of their lives. 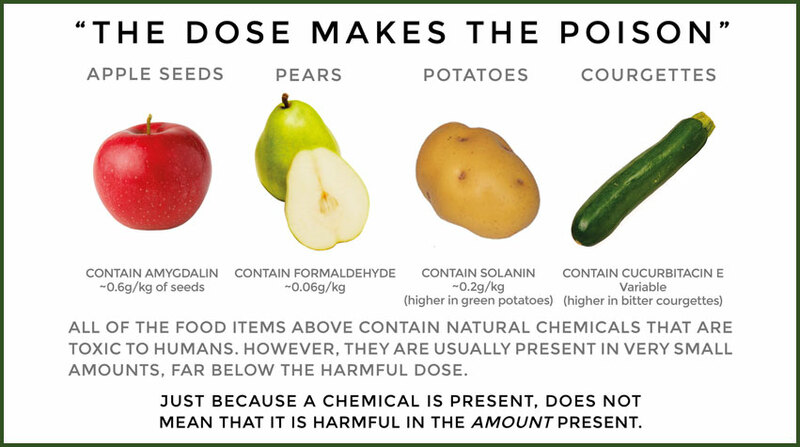 The graphic is pretty misleading, and so is the title “The Dose Makes The Poison.” In many cases, what makes the poison worse is the delivery method. So, we are not really comparing apples to apples. For example, formaldehyde is already present in our blood and cells. Our bodies are quite familiar with it. And although it’s naturally present it pears, this type of formaldehyde isn’t harmful to us because our gut breaks it down after it is ingested. The route to formaldehyde toxicity is through inhalation, and it is dangerous when there is long-term exposure. Exposure to, let’s say, lathering up with formaldehyde-releasing shampoo and body wash, spritzing perfume in the morning, spraying cleaning products around the house, and maybe even visiting the nail salon. That’s hardly the same thing as eating pears. So, what exactly is a safe dose of synthetic chemicals? Well, it’s supposed to mean that the amount of chemical present will do no harm. The problem is that safe limits are continually evolving. Safe doses currently do not take into account the risk of repeated, long-term exposure to one or more chemicals, the way in which they accumulate in the body, or the way they influence each other. Studies have shown chemicals to be carcinogenic (cancer-causing) decades after they have been released into the environment (DDT, BHA, and recently Glyphosate, etc.). For this post, I’m discussing the top 10 chemicals to avoid ingesting through your skin. I’m not talking about eating pears and apple seeds. I’m talking about harmful chemicals hiding in plain sight. They are known carcinogens. They disrupt the endocrine system, and are especially bad for children, teens, and pregnant women. Here’s a question: Why are companies allowed to use them? 1. PARABENS Widely used as preservatives in many cosmetic products. They are oestrogen-mimickers and are associated with increased risk of breast cancer. These chemicals are absorbed through the skin and have been identified in biopsy samples from breast tumours! Ditch It: Found in makeup, body washes, deodorants, shampoos, moisturisers and facial cleansers. 2. SYNTHETIC COLOUR If you take a look at a product label and notice FD&C or D&C, they represent artificial colours. F, representing food and D&C, representing drugs and cosmetics. These letters precede a colour and number (D&C Red 27 or FD&C blue 1). Synthetic colours are derived from petroleum or coal tar sources, are suspected human carcinogens, skin irritants and are linked to ADHD in children. The European Union has banned them in food. Ditch It: Found in makeup (especially lipstick, eye shadows and other high pigment products), colourful personal care products, processed food and confectionary. 3. FRAGRANCE/PARFUME Loophole alert: this term was created to protect a company’s proprietary formula. This particular category is scary. Hundreds of toxic chemicals can be hidden in this one, seemingly harmless, term. As the consumer, the ownness is on you to be aware. J & J (a family company) isn’t going to explain this on the back of their baby wash. According to the Environmental Working Group (EWG) Skin Deep Database, fragrance is associated with allergies, dermatitis, respiratory distress and potential effects on the reproductive system. Beware the term “natural fragrance”, which is not really any better. Ditch It: Found in perfume/cologne, deodorant, hair products, body wash, moisturiser, baby products, air fresheners, and scented candles/melts/diffusers. Basically found in anything that isn’t scented entirely with real essential oils. 4. PHTHALATES A actually group of chemicals to avoid. Phthalates are used in hundreds of products to increase the flexibility and softness of plastics. The main phthalates in cosmetics and personal care products are dibutyl phthalate, diethyl phthalate (DEP), and dimethyl phthalate. They are known endocrine disruptors and have been linked to increased risk of breast cancer, early breast development in girls, and reproductive birth defects. Unfortunately, they are not disclosed on every product as they are hidden under the term, fragrance. Sigh. Ditch Them: Found in nail polish, deodorants, perfume, fragrance and cologne, denatured alcohol, hair spray, Hair Dye, and face/body moisturisers. 5. SODIUM LAURYL/LAURETH SULFATE (SLS) / (SLES) These are surfactants, which are responsible for creating a rich, sudsy lather. They can be found in more than 90% of personal care and cleaning products. SLS’s are known to be skin, lung, and eye irritants. A major concern about SLS’s is their potential to interact and combine with other chemicals to form nitrosamines and formaldehyde, both carcinogens. These combinations can lead to a host of other issues like kidney and respiratory damage. Ditch it: Found in shampoo and foaming cleansers for face, hands and body. 6. PROPYLENE GLYCOL A skin conditioner used in many personal care products. This chemical penetrates the skin deeply, causing organ system toxicity and irritation to the eyes, lungs and skin from long-term exposure. It has also been associated with dermatitis and hives. The sensitization effects can be manifested at concentrations as low as 2% in any one product. Ditch It: Found in moisturisers, sunscreen, cosmetics, makeup, deodorant, conditioners, shampoo, hair spray, ice cream and processed foods. 7. TRICLOSAN A widely used antimicrobial chemical, known skin irritant and endocrine disruptor, especially thyroid and reproductive hormones. Studies are raising concerns that triclosan contributes to making bacteria antibiotic-resistant. By the way, there isn’t enough supporting evidence that shows washing with antibacterial soaps containing triclosan provides any benefit over washing with good-old-fashioned hot, soapy water. Triclosan is definitely on the list of chemicals to avoid. Ditch It: Found in toothpaste, antibacterial cleansing products, hand sanitisers, and deodorants. 8. FORMALDEHYDE A carcinogenic preservative used in many cosmetic, personal care, and cleaning products. This one is also hidden in terms that are less likely to upset consumers (Urea, Methylaldehyde, Formic Aldehyd, Quaternium 15). It’s linked to occupational related cancers, is known to cause allergic skin reactions, and inhibits the immune system. Ditch It: Found in nail varnish/treatments and remover, body washes, conditioners, shampoos, cleansers, eye shadows, hair dye, tattoo ink (completely unregulated), and home cleaning products. 9. TOLUENE A petrochemical derived from petroleum or coal tar sources. You may see it on labels listed as Benzene, Toluol, Phenylmethane, or Methylbenzene. It is a potent solvent able to dissolve paint! It affects the respiratory system, causes nausea, irritates the skin, and has been linked to immune system toxicity. Pregnant women should avoid exposure to toluene vapours as it may cause birth defects and developmental delays in their infants. Ditch It: Found in nail varnish/treatments and remover, hair dye/bleaching products, home cleaning products, furniture/floor polish, paint and paint thinner, and many types of adhesive films. 10. SUNSCREEN CHEMICALS Common names for chemicals to avoid in your sunscreen are Benzophenone, PABA, Avobenzone, Homosalate and Ethoxycinnmate. These chemicals function as a sun-blocking agents, absorbing UV rays. They are known endocrine disruptors, and are easily absorbed into the blood stream. They may also cause cellular damage and be carcinogenic. Not only that, but they are toxic to aquatic life. Ditch Them: Found in conventional sunscreen products. Look for (non-nano particle) zinc-based products instead. It’s impossible to avoid every single toxic chemical. You’re only human and you have to live! Being aware is the first step. Educate yourself and do your research before you buy products for yourself, your family and your and home. When in doubt, check the EWG’s Skin Deep Database to research ingredients you don’t recognise and chemicals to avoid. Do you check your beauty product labels? We would love to hear from you!